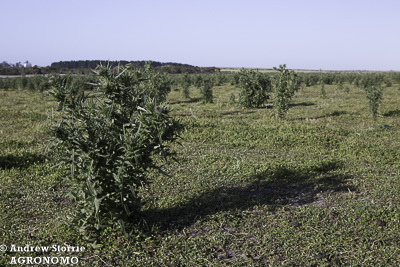 To successfully manage weeds, pests or diseases they must be correctly identified. Mis-identification leads to incorrect control practices which is costly and often makes the problem worse. Fallopia convolvulus flowers and fruit. Many people still rely on common names of weeds for their identification, however this leads to problems because many species have multiple common names. 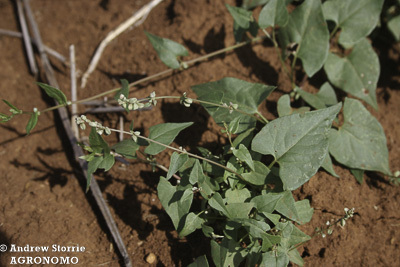 Some names are only used within some states or even districts such as Fallopia convolvulus which is known as climbing buckwheat in Queensland and black bindweed in New South Wales. A more interesting example is Conyza sumatrensis which is normally called tall fleabane. However on the north coast of New South Wales it is often known as cobbler’s pegs. Cobbler’s pegs are actually Bidens pilosa which look totally different. Originally the naming of plants and animals was based on where they came from. For example any animal from the sea was called a fish. This included whales and dolphins. Many Australian plants were given English names because the colonisers had a European world view. For example the tallest flowering tree in the world - Eucalyptus regnans – was called mountain ash. It looks nothing like European ashes (Fraxinus spp.). Our modern naming system of genus and species comes from Carl Linnaeus (1707-1778) who divided flowering plants into groups depending on their flowers and fruits. Unfortunately identifying plants by flowers and fruits is too late for most management strategies. Therefore it is good to use vegetative characteristics to identify plants. This has the major benefits of early weed identification which are cost effective allowing timely management strategies to be implemented. Land plants are divided into groups of increasing complexity in structure, particularly the vascular tissue and how they reproduce and spread. It is generally accepted that land plants commence with green algae and goes through to the flowering plants. Club mosses - single veins in small leaves, and union of stem and leaf without a break in the vascular tissue of the stem. Reproduce by spores. The starting point to narrow down and identify the majority of weeds (flowering plants) is to figure out whether they are monocotyledons or dicotyledons. It is also handy to know over half of weeds come from 5 families of flowering plants - Asteraceae, Brassicaceae, Fabaceae, Poaceae (monocot) and Iridaceae (monocot). Knowing the types of environment in which certain weeds like to grow can help narrow down the possible candidates. 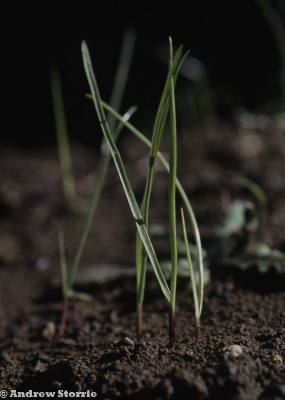 Weeds like annual ryegrass however will grow over a range of environments. Some examples are given below. Capeweed (Arctotheca calendula), matricaria (Oncosiphon piluliferum), Geranium spp., Erodium spp., sorrel (Acetosella vulgaris), annual ryegrass, Vulpia spp., wild radish (Raphanus raphanistrum), Paterson’s curse (Echium plantagineum), Indian hedge mustard (Sisymbrium orientale). It is always a good idea to collect specimens for correct identification. There are plant identification services at the various State herbaria. If it is a new species for an area there will often be no charge however if it is a common weed or plant there will be a fee. See how to collect and prepare specimens for identification here. With smart phones being ubiquitous technology everyone has the tools to take great photos, but it is annoying to receive blurry images someone expects you to give a miraculous ID from. Firstly make sure that your images are in focus! Take a series of images. Include the whole plant then get close enough to show detail. Don’t have the subject mixed in with lots of other plants. Isolate the plant you want to photograph from the background or other plants. You also want light on the front of the subject and not have bright light or reflection behind the subject. Include an object to give an idea of size – fingers, coin etc.. Finally you actually want a flower/seed head and a leaf and stem in the image. These must be in the same plane (side-by-side) otherwise something will be out of focus. An effective technique is to hold the leaf/stem and flower/seed head up to the sky at arms length with the sun behind you. The image will be in focus, well lit and have necessary detail to allow identification. Include information with the images - location, soil type, vegetation association, and plant habit – annual, perennial, tree, shrub, herb or vine. 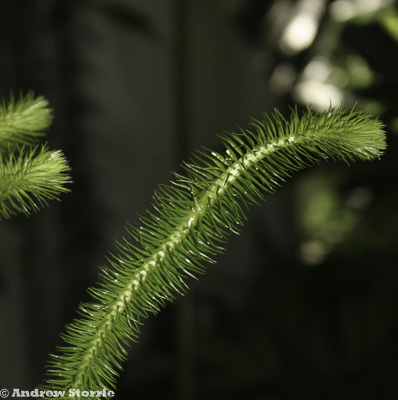 Club moss - an early type of green plant that reproduces by spores. Two cotyledons of Fumaria spp. with first true leaf beginning to emerge. Spiny rush along the edge of the Hunter River, NSW.